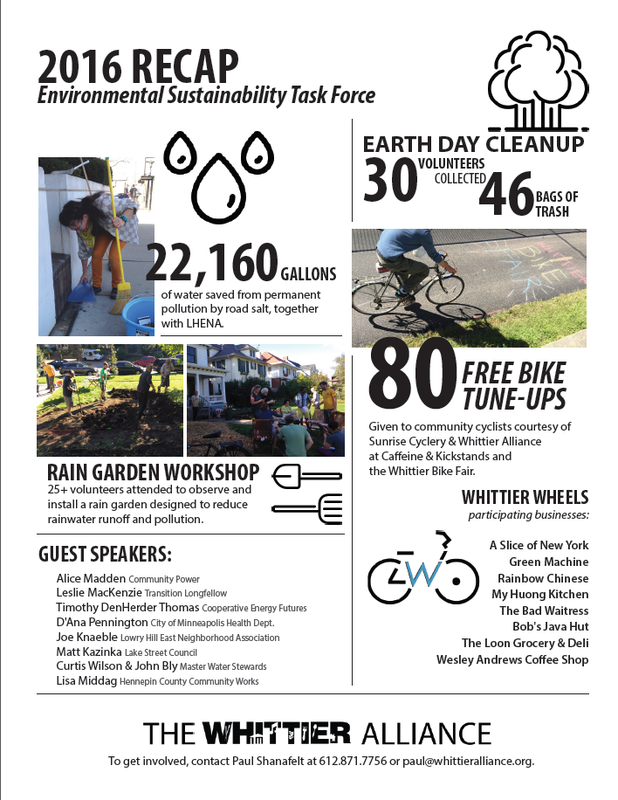 ​One of the goals in the Whittier Alliance Strategic Plan is for the neighborhood to become a model of environmental sustainability. The initial ESC focus in 2016 was educating community stakeholders about energy conservation/local generation, including energy assessments and community solar gardens. Members of the Committee have now branched into creating Whittier Wheels, applying for grants for stormwater projects and promoting green space in the neighborhood. If you are interested in working with some like-minded people to make a positive environmental impact at a local level, this is the Committee for you! Contact us at the Whittier Alliance office (info@whittieralliance.org or 612-871-7756) if you are interested in finding out more about any of our Environmental Sustainability Committee or joining the email list for meetings. Meeting time and locations are also regularly added to our website calendar.